In 1931 James Truslow Adams coined the phrase “American Dream”, which he described as “that dream of a land in which life should be better and fuller and richer for every man…, a dream of a social order in which each man and woman shall be able to attain to the fullest stature of which they are innately capable.” This has been the hope of all those who have been drawn to the land of Liberty since its founding in 1766. In this book, historian Nicholas Hagger uncovers a startling new version of the American Dream that has been kept secret from the wider world – until now. He explains the breathtaking plan formulated by President Obama and his inner circle to extend the Dream to all humanity, who will one day live together in peace and prosperity – under the benevolent rule of a World State initiated by the United States and founded on American values. The Secret American Dream explores the growth of American global power through seven historical phases of expansion. Meticulously researched and persuasively argued, it proposes that the roots of America’s global dominance lie not, as is commonly believed, in the 1890s acquisition of Hawaii, the Philippines, and other overseas territories, but in the time of the Founding Fathers. Inspired by Freemasonic ideals, they pressed for a federal state that would become, in Thomas Jefferson’s words, an “Empire of Liberty”. This state subsequently undertook a vast westward expansion across an entire continent. The path to the dream of a World State, Hagger argues, has been hindered on the one hand by bouts of isolationism and on the other by the commercial aims of a small number of wealthy élites, who largely engineered America’s emergence as a global superpower after World War II. Obama and his circle seek to replace this self-interested global supremacy with an altruistic and philanthropic leadership that will culminate in the creation of a World State to the good of all peoples. The World is broken. Can America fix it? For four hundred years, immigrants have been drawn to North America by the ideals of liberty, prosperity and personal fulfillment for all. However, sharing all the benefits of the ‘American Dream’ meant becoming an American and living in the United States. 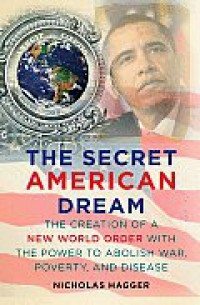 In this gripping, accessible and highly informed sequel to The Secret Founding of America, Nicholas Hagger present compelling evidence that those running Obama’s America have a secret plan to create a benign global government. Endowed with the power to abolish war, poverty, famine and disease, the New World State will establish a universal peace under which humankind can prosper both materially and spiritually, extending the American Dream to everyone on Earth. QUESTIONS controversial beliefs: Is the US in decline? Is it facing a “clash of civilizations” with the Muslim world? Nicholas Hagger’s books reveal truths that have been hidden, and are rewarding. He has devoted much thought to unearthing the pattern of history, and he presents a new approach to the passing of nation-states into a coming World State.